However, using Smashwords today feels slow, sluggish and cumbersome. Sure, there have been changes and improvements to distribution, but Smashwords’ metagrinder and autovetter have not changed in years. The process of uploading an ebook and having it approved is slow, tedious and cumbersome. Enter Draft2Digital and ebook publishing becomes a totally different experience. Fast, simple, easy and highly automated. There are so many features that I love about Draft2Digital that I’ll have to do this in list form. Unlike having to wade through Smashwords’ 170 odd page Style Guide to get a manuscript approved, Draft2Digital only requires your text in a Word document with chapter headings styled in Header 1 and body text in Normal. You don’t need a title page, credits page or other books pages as they are all added later. All you need is Chapter One to The End. When I uploaded my first ebook, I immediately checked the .epub version thatDraft2Digital prepared for me to download, and the formatting was 100% perfect. No fuss, no bother, no errors. Your book description can be styled a little with bold and italic, which is a nice touch, but I really like how easy genres and keywords can be added. Genres have a search box, so it makes selecting genres quick and easy. For keywords, simply copy and paste your comma separated keyword list into the box, and they are automatically listed individually. This is where Draft2Digital absolutely shines. Once you have uploaded your manuscript, cover and entered your book details, it’s time to let Draft2Digital’s automation take over. 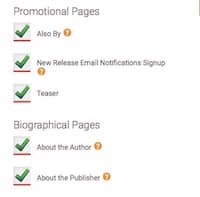 A list of tick boxes lets you add a Title Page, Credits Page, Dedication Page, Books Also By Page, New Release Email Notification Page, a Teaser Page for another book, About the Author and lastly an About the Publisher Page. What a list of add-ons! only need to enter your author and publisher details once, and they can be added to all books. For me, the winner here is the book teaser page. Being able to select a book with one tick box to add at the end of a book is a fantastic book marketing tool, particularly for books in a series. All of these tick boxes add valuable features to an ebook. It is so simple, you have to ask why nobody thought about this earlier. This feature is the BIG, BIG, BIG reason I am moving to Draft2Digital. On every other platform, including KDP, every other already published ebook needs to be changed when I publish a new ebook or delete a title. For me, with eighteen ebooks to manage, this has always been a nightmare. When I publish a new ebook, I have to add the new title to all my other books back matter, and then upload every one again, and wait for the approval process all over again. Yes, eighteen times for KDP and eighteen times again for Smashwords. That takes days and days! But with Draft2Digital, it’s a one-click process to have every one of my ebooks updated and distributed with all new ‘Also By’ pages. Anything that saves me days of work gets my vote. There is no doubt that Smashwords has more distribution channels than Draft2Digital, but for me, Apple, B&N and Kobo are the only ones that have reasonable sales potential. Draft2Digital distributes to these main three, plus some others, so that’s all I need. I have also noticed that Draft2Digital seems to get titles published and available for sale much faster than Smashwords for the bigger retailers. Another nice touch is that Draft2Digital sends a confirmation email every time one of my titles is published on a retailer’s site, with a link to my book page. It’s far too early for me tell, but for the few sales I have made so far, the reporting has been super fast. As I have sold ebooks through Apple, B&N and Kobo for many years now, I expect sales will be the same. Another big win here for Draft2Digital because it pays monthly by EFT or Paypal, unlike Smashwords that still pays quarterly. It is worth mentioning here too, that when I set up my account withDraft2Digital, it gave me the option to complete my tax details online, which only took a few minutes. I have only sent only one message to Draft2Digital support, but it was answered in a very timely and helpful manner. My experience over the years with Smashwords has been the same. Unlike KDP support, which is notoriously hopeless and unhelpful. Why did it take me so long to get around to trying Draft2Digital? All I can say is that it is by far the easiest platform to self-publish with features that are useful, practical and very time efficient. It is far, far better than both Smashwords and KDP. The only major disappointment I have found is that Draft2Digital has been very slow to launch their reader site, Books2Read. From what I have read on the Internet, the site has been ‘Coming Soon’ for a very long time now. As the email notification page is a feature that I would imagine hooks into Books2Read, some progress on this seems well overdue. Update Note 1: Draft2Digital also has an option to publish a paperback version with Createspace. I have not tried this feature but will keep it in mind for my next book. Update Note 2: Books2read is now working and is the site from where you can set up universal book links. A very handy tool for open-publishers. Update Note 3: Draft2digital has added a new typography feature for ebooks. It’s beautiful! You can read my earlier first impression post about Draft2Digital here. Update Note 4. Draft2digital now distributes to Amazon. Read the details in this Draft2Digital blog post. I’ve just published my first book on D2D and I fully agree with everything you say. As a complete non-techie, I found the process phenomenally simple and, more importantly, fast. I did have a look at the paper back option but, and it’s a big but, they set a minimum price to cover printing costs and, unless you’re producing a really weighty tome or have a sizeable following already, it’s not really an option at all. Nobody is going to shell out more than $5 for a first book from an unknown author. Aside from that one very minor gripe, D2D is fabulous. Plus, it’s a very welcome wake-up call to the big A to stop changing the rules every 5 minutes and ripping us off just because it’s cornered the market. Yes, I agree about the paperback option, Dave, I really like D2D for ebooks, and especially the automated front and back matter, but I will continue to use Createspace directly for my paperbacks. Based on this, I am going to give D2D a serious try. I have been KDP exclusive and want to once again roam the open range. Now, as to the no one will pay…forgettaboutit. If you do any local promotions at coffee houses, liberries, book stores, open markets, clubs, downtown on the mall, etc., readers will buy your book for much more than $5. That is the mass market paperback price (actually, they are higher). My first book, WATER, is priced at $17.95 retail, but when I am at an event I just sell it for $15. I make about $9 a book (CreateSpace prints). Book 2 in the series, VOTE, is $14.95 (a better price). I still make $9. People want to rub elbows with an author, so if you can organized some events for yourself — work it! And they love the autographs. Liberries? Seriously? You’re a writer? I’ve published successfully on CreateSpace and tried Smashwords to my great frustration — the features of being able to preview the book or the cover are missing. You cannot even save what you’ve entered, so if you have to leave; it’s all gone and you have to start over — surprisingly incompetent programming. I asked tech support how to correct the name of the author and got no answer, so it looks like I’d have to republish the whole book. Smashwords has been very disappointing. I’m happy to hear D2D is notably better. Several months ago I plunged into self-publishing. The obvious route to check was Smashwords. I spent way too much time reading how to use the site. I was not the typical first time user because I already was familiar with a lot of the terminology, having done some page layout in my job. I thought that if I was put off by the complex instructions, how would an ordinary person get through them! Then I discovered D2D and decided to try them out. Wow! Like night and day! I called their support people and must have gotten the best support gal in the world. She put me at ease and was always glad to hear from me as the process moved forward. I never felt like I was a bother. When I asked her to accommodate some features that they normally did not do, she would check to see if there was a work-around. Sometimes the answer was yes, sometimes no, but she was helpful and gracious every time. I am pleased with the results of the paperback and ebook, and months later when I called to say I was planning another book, she was like an old friend. My experience has been quite positive. Very good news to hear, Joan. I must admit that after using Smashwords for years, I had the same impression the very first time I used D2D. Wow! Do you need to own an ISBN number to publish on Draft2Digital? And, if yes, does it have to be the same ISBN number as a CreateSpace publication? I have my first-ever book ready, and a cover prepared on Fiverr, but no (as in zero) technical skills, or much in the way of understanding publishing rules/requirements. Thanks for a thorough and encouraging article. No, you don’t need your own ISBN. Draft2Digital issue a free ISBN when you publish with them. If you use their ISBN, does it have any limitations? I know on KDP and Create Space, that using their ISBN’s limit distribution, limiting access to some markets…at lest for eBooks. It’s best to use your own ISBN…that way, it’s your book…you’re in control of where it goes…and who sells it. Smashwords has dissapointed me a lot. I published four books with them without earning a single penny. But many of my books in Draft2Digital are doing well. When it comes to use of technology with transparency and efficiency, Draft2Digital is far ahead of Smashwords. The real problem with Kindle, in my opinion and from my own experiences, is that your book is competing with a gazillion and one other titles, so that makes it incredibly challenging. Amazon is defiinitely the biggest seller of ebooks, William. But to access Apple, B&N and Kobo you need an aggregator. So the choice is between Smashwords and Draft2Digital. Neither are publishing to Amazon. I would advice new as well as established authors to opt for Draft2Digital. It is 1000 times better than Smashwords. When you publish your book on Draft2Digital, it will support you right from the beginning to the end. On the other hand Smashwords would just do the opposite. It will make it very difficult to publish your books due to their stringent policies and unfriendly approach towards authors. Even if you manage to publish your book there, it is highly unlikely that you will make money there. If you don’t believe me, search on internet and you will find a lot of negative comments about Smashwords. I started with Smashwords right from their get-go. Very frustrating. Used other services since then but now moving all titles (we have a lot of them) to D2D. Was notified today that Pronoun is shutting down, and I will have to find another distributor. I have five titles at the present time, and 95% of my sales were on Amazon. Considering the 15% fee D2D charges, and the low number of sales from non-Amazon retailers, would it still be worth it to sign up with D2D in addition to KDP? It seems logical to put my eggs in more than one basket, but I hesitate at the costs to do so – both $$ and time. It’s quick and easy to publish on D2D, Alexander. And, any sales you get, are sales. So I believe it is worth the time to use D2D. I can’t recommend D2D highly enough. I learned of the site via Bookfunnel (another awesome site for authors) as they send writers there to convert their books to epub before creating a download page (D2D allows you to convert your books without moving any further forward and distributing through them. I kind of think this awesome freebie will one day be discontinued, but in the meantime it’s great.) I also have a couple of books listed for distribution with D2D and it’s 1000x easier to use than Smashwords. Plus, they offer really cute and creative formatting styles! Who doesn’t love a curly scroll or a brooding smudge as you begin a new chapter? I was wondering if an author could publish the same titles on Smashwords AND D2D at the same time? Or is it not allowed? No, Jennifer. You can’t publish on both as you would have duplicates on Apple, Kobo and B&N etc. BUT, if you want to access different channels (retailers and libraries) via each aggregator, then, maybe. I am currently considering self-publishing and came across Smashwords a few weeks ago. I have published a free e-book with them, though the discovery seems to be something I wouldn’t get in years. Formatting my book wasn’t a rather big problem, even with Smashwords. However, I was intimidated by the huge amount of time I had to spend to get a valid epub output. I am experienced in InDesign and also know how to create epubs using Sigil. But even this option was cut-down for me on Smashwords as the epubs wouldn’t be eligible to go with all the channels (according to the site). What I found most easy on D2D was the formatting of course. I just had to use the normal style for the body text and Heading 1 style for chapter headings and such. The whole process was streamlined and made more sense. Right now, I am baffled by the tax payer information that I have to enter into D2D. I am from Maldives, and according to the site, 30% of my income would be withheld. In this case, I am starting to think it would be near-impossible for me to get anything at all. We can’t withdraw money from Paypal to our local bank accounts, and as workaround, I have resorted to Payoneer. D2D won’t pay me unless I earn USD 20, and the local bank charges a huge percentage of the amount I would be withdrawing from my Payoneer account. Any advice? Sorry, but after some years with Smashwords and their trashing of my account, I thought I’d try D2D on the basis of your review, which seemed thorough and thoughtful. I submitted my .docx draft of a published book to D2D but found it needed some tweaking. I mistakenly thought I’d be able to change some front matter, etc., after it was downloaded but before publishing. D2D’s overall interface seemed logical. Seemed. The next thing i knew I was getting instructional emails from them talking about how things worked, but that had nothing to do with reality. Also, I suddenly found myself immersed in something called “Books2Read” without explanation and without a book yet published. 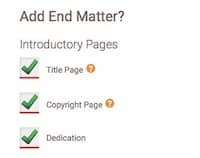 Matters went further downhill until I sent an email telling them that things weren’t as described, and if they couldn’t help me then please close my account. Help, they didn’t. Close the account, that they could do and did. So based on first impressions, I’d say D2D might produce results for the initiated, but for a D2D newbie, bad news. Does Draft 2 Digital have DRM for the books? Yes. But you have a choice. You can select DRM or not in Advanced User Options. Can you use italics? The epub output versions I have used before will underline. Yes. I’ve never had a problem with italics. Does the ISBN follow? Such as if zi want to publish on Blurb or booktracks? From memory, I think you can use your own ISBN. Hi – This is my first go at self-publishing. Am a bit confused! So…let’s see. I want to publish through KDP Select. Can I go that route by using D2D? Or not? Hi Arti. No. If you enrol in KDP Select you cannot use any other online publisher. KDP Select has very strict terms Best to avoid it if you want to make your ebook available on other retailers. Thank you for replying (though I don’t know where my comment went but at least it reached you). I did read that article and I do want to give KDP Select a shot for 90 days. I would have a readership in India and would like to use that feature of KDP Select (at least for 90 days). But what you are saying is that I cannot use D2D and then KDP simultaneously? Is that right? I was thinking of trying KDP select and then switching out of it to KDP, but I can’t do that with D2D as my primary publishing source – did I understand correctly? Or am I totally confused? Sorry about that…. That’s right. You cannot use KDP Select and D2D at the same time. You must finish your 90 day period, and then un-enrol from KDP Select before you can use D2D. Okay Derek. I got it. So…I can go ahead and try KDP Select for 90 days and then when I am ready to move out, I could shift to D2D. Hello I am new to all of this so I was wondering what is the best application to use when formatting your book before uploading it D2D for review and publishing? You can use Microsoft Word for D2D. Do I have to number my pages on Microsoft Word or does D2D have a feature that does that for me? D2D will add your page numbers for an ebook. Ok thanks, so I gotta have two copies of my book file on Microsoft Word. One with the page numbers for paperback publishing and one without numbers for digital publishing am I right? I didn’t know that ebooks had page numbers, only print books. Ok thanks, also is it better to get my own ISBN or allow D2D to give me one for free? It’s up to you. But I don’t see a lot of benefit in buying an ISBN for an ebook. The free one works just as well. It might be a connection problem. But contact D2D support for help if you need it. I have one KDP ebook and same also have print version initially through createspace but now migrated to KDP. Can I add same ebook to D2D platform? It already has ASIN and print book already has ISBN. What I will retain at D2D? Or I will have to get new ISBN? As long as you are not enrolled in KDP Select, Khuram, you can publish with D2D. Your ebook’s ASIN is an Amazon identifier, but D2D will issue a new ISBN for your ebook. Thank you for the great content. I’m about to publish my very first book so this is all very new to me. I’ve been wondering which retailer(s) to use. This article covers several differences between smashwords and draft2digital, but it did not mention the differences between them in terms of how much they pay authors. I’m hoping to find out the differences between smashwords, draft2digital, KDP (Select), KOBO, NOOK, iBooks etc these major players. Thank you.